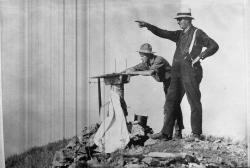 Pictured: Ed Pulaski (right) and an unidentified man at a fire lookout station. Inspired by Timothy Egan’s best-selling book, The Big Burn is the dramatic story of the massive wildfire that swept across the Northern Rockies in the summer of 1910. The fire devoured more than three million acres in thirty-six hours, confronting the fledgling U.S. Forest Service with a catastrophe that would define the agency and the nation’s fire policy for much of the twentieth century. As America tries to manage its fire-prone landscapes in the twenty-first century, The Big Burn provides a cautionary tale of heroism and sacrifice, arrogance and greed, hubris and, ultimately, humility, in the face of nature’s frightening power. Written and directed by Stephen Ives, The Big Burn, an American Expereince presentation, airs Tuesday, January 22, 2019 at 9 p.m. on WXXI-TV.